Binco is a comparatively low-priced clothing store that the player may visit in Grand Theft Auto: San Andreas. Binco was also intended to appear in Grand Theft Auto IV, however it was replaced with the Russian Shop for unknown reasons. Binco logos still remain around the city, however, including on vans. Binco reemerges in Grand Theft Auto V as one of the available clothing stores. Las Venturas Airport (near the Las Venturas Hospital), Las Venturas. Binco is not based on any specific real-life store, though it may be either a thrift store or clothing exchange store like Plato's Closet or Ross. This could possibly explain the signs in the store which read "Everything 99¢", despite having nothing in the store that sells for 99¢. The store's motto is, fittingly, More trash for less cash!. 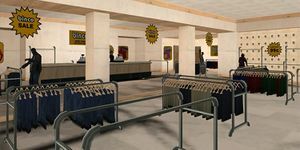 Shared interior of all Binco clothing shops in GTA San Andreas. The range of clothing offered at Binco in GTA San Andreas are generally affordable, with prices that do not exceed the $100 mark. The store's selection of items are centered around generic clothing, as well as low-end clothing commonly donned by gang members. The store also offers various novelty articles of clothing, such as joke eyepieces, masks, and a cowboy hat and cowboy boots. Binco also earns the distinction of being the only store chain to sell briefs (known as Boxers in-game, which can only be worn without pants) to the player. For a comprehensive list of clothing available from Binco in GTA San Andreas, see /Clothing in GTA San Andreas. The default clothing for GTA San Andreas protagonist Carl Johnson is entirely derived from Binco's range of items, including the White Tank (Torso), Blue Jeans (Legs) and Black Low-Tops (Shoes). The Green Hoody has a small Rockstar Games logo. In GTA IV, if Niko walks into Modo wearing certain outfits from other stores/sources, the sales assistant will ask if he has been in "a Binco explosion". Binco is mentioned by Frankie Boyle in one of his Split Sides routines in The Lost and Damned, as part of the insult "looks like someone shaved a monkey and kicked it through Binco". A Binco Mule in GTA San Andreas. Advertisement in GTA IV showing a Binco where the Russian Shop would be in the retail version. A Binco Yankee in GTA IV. This page was last modified on 19 March 2014, at 04:42.